Properties in Croatian Parliament average 4.6 out of 5 stars. Property 51: Idealis Zagreb will leave you speechless. Property 67: Nice and cosy apartment, just 20 min walking from the old core of Zagreb. 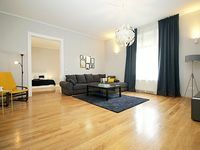 Property 76: Apartment Aura is cozy and homey apartment in Zagreb, the capital of Croatia. King's home is located in a private house and has its own entrance. Property 94: King's home is located in a private house and has its own entrance. Apartment is super close to Ban Josip Jelacic square and was larger than I anticipated! Host connected with us to thoroughly explain how to find the apartment as there are a few doors to go through to find it but had it us feeling very secure :) Wifi password was clearly displayed, everything was clean and just overall great !